Having travel range of 33 (X) x 15 (Y) x 5.25 in. MillSlide™ (Z) with 16.5 in. (knee) and 5.9 in. quill, VK4II CNC Knee Mill features two-speed 3,900 rpm spindle. Programmed using G-code or a CAM system, unit comes with 8200B CNC with 1 GM memory, 2 GB disk storage and 12 in. LCD monitor. Offering ram travel of ±11.5 in. with ±90° head tilts, product is equipped with table guard, power knee and power draw bar options. Milltronics USA, Inc. introduces the latest generation of its very popular VK Series with the new VK4II CNC knee mill. With more than two dozen improvements over the previous version, the VK4II retains the unique Milltronics MillSlide™ Z-axis. Popular in tool rooms, prototype, R & D and job shops, VK Series machines offer a true 3-axis control and can be run as manual, teach or full CNC. The MillSlide™ provides greater rigidity and allows a programmable Z-axis that can also be operated manually with a quill handle. Travels are 33” (X) by 15” (Y) by 5.25” MillSlide™ (Z) with 16.5” (knee) and 5.9” quill (manual). The machine has a 54” x 12” table with 1,500 lbs. capacity. Powered by a 7.5 hp backgeared motor, the VK4II is a #40 taper with a two-speed 3,900 rpm spindle. It’s a very flexible machine as the head tilts +/- 90°, offers +/- 11.5” of ram travel which also swivels +/-90°. Standard handwheels are directly coupled to the ballcrews and provide feedback to the operator. Options include flood coolant & drip pan, table guard, power knee and power draw bar. 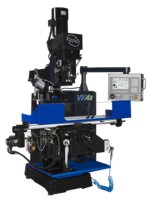 Featuring the Milltronics Series 8200-B CNC, the VK4II can be programmed with easy conversational, G-code or a CAM system. The 8200B is a PC-based control with advanced processing speeds and 1 GM memory, 2 GB disk storage, a 12” LCD monitor and membrane keys. It has easy navigation function keys, solid model graphics, 3D pocket, DXF import, pockets & islands, tool tables, help screens, mid-program restart, handwheel run, scaling, mirror image, rotate and a variety of canned cycles such as drilling, boring, tapping, milling and more. Milltronics USA, Inc. is based in Waconia, Minn., and is a leading supplier of easy-to-use and cost-effective machine tools serving job shops, tool rooms, tool & die and other metalcutting customers worldwide. With more than 12,000 machines installed, the company has built its reputation on intuitive controls and well-built machines backed by superior service and support. More information is available at www.milltronics.com.